* There is a $75. 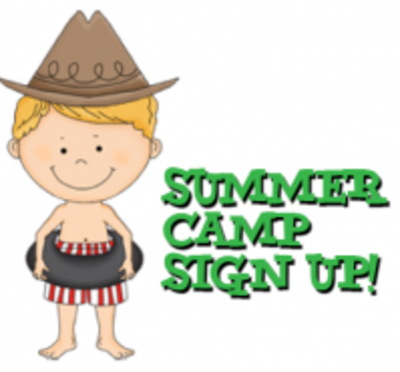 non-refundable activity fee for the camp that goes towards purchasing a summer camp t-shirt, cooking supplies for cooking day and arts & crafts materials. Let’s Rodeo – June 8th – June 12th – Grab yer boots, hat and spurs for a rootin’, tootin’ week. We will learn about the Wild West lifestyle and take a gallop through Donley’s Wild West Town on Thursday, June 11th. Please be sure to pack your lunch. Cost for this field trip is $25.00. Fore, Touchdown, Goal! – June 15th – June 19th – Sports, games and competition will be center court this week! Calling all dads as we recognize and honor their important role in the lives of their children…on Thursday, June 18th, Dads are invited to join us at Wheeler Park for a round of mini golf. Dads and children be sure to pack your lunch and bring a blanket for a picnic in the park. Cost for this field trip is $10.00. Clowning Around – June 29th – July 3rd – Lions and Tigers and Elephants…OH MY! A week full of balancing acts, silly faces, and sweet treats. On Thursday, July 2nd, children will have a surprise visit from a clown. Please be sure to pack your lunch. Cost for this in-house field trip is $10.00. Diggin’ Dinosaurs – July 6th – July 10th – ROAR! We will be digging up our past this week as we focus our learning on prehistoric life. Children will visit The Field Museum on Thursday, July 9th, to go head to head with SUE the T-Rex. Please be sure to pack a sack lunch. Cost for this field trip is $20.00. Lights, Camera, Action! – July 13th – July 17th – Nickelodeon has nothing on 5-Star’s talent! Watch our children learn the ins and outs of media life and express their talents. Thursday, July 16th, we will visit Randall 16 to view the newly released Minion Movie. Please be sure to pack a sack lunch. Cost for this field trip is $10.00. Birds & Butterflies – July 20th – July 24th – Spread your wings as we focus on the beauty and life cycles of Birds and Butterflies. Thursday July 23rd we will take a field trip to Peck Farm and visit the award winning Butterfly House and Hawks Hollow which features eight interactive learning stations. In addition children will take a guided tour through the trails in search of insects to add to their own bug box. Please be sure to pack your lunch. Cost for this field trip is $10.00. Domestic Animals vs. Wild Animals – July 27th – July 31st – Calling all Pet Detectives! Children will discover the responsibilities of having a pet and learn the differences between a domestic and wild animals. We will also study animal habitats. On Thursday, July 30th, we will take a field trip to Petland, where we will be given a tour of the store and educated on animals they carry. Cost for this field trip is $10.00. Aloha! – August 3rd – August 7th – Imagining we are at the ocean, we will explore hands on activities with sand and water along with a celebration of our 5-Star Luau. Thursday, August 2nd, children will have the opportunity to dig their toes in the sand and splash in the water at Otter Cove. Cost for this field trip is $15.00. See Ya Later, Alligator! – August 10th – 14th – As we wrap a fun packed summer camp program we focus our last week on reptiles and amphibians. Thursday, August 13th, children will attend an educational experience focusing on the world’s rainforests and threatened and endangered species followed by a family style kid friendly lunch at The Rainforest Café. Cost for this field trip is $25.00.